British minister Hugo Swire's offer to support the cause of universal suffrage in Hong Kong hasn't gone down well with some papers - with one labelling him a "broken-headed cricket". Beijing-backed paper Ta Kung Pao puts Sino-British relations "at a historic low" after the Foreign Office minister's weekend editorial in the South China Morning Post declared the people of Hong Kong should have a "genuine choice" of leader in 2017. Ta Kung Pao uses the insect comparison after recalling previous criticism of Swire over comments about Tibet. Apparently, a cricket with a damaged head is said to fight opponents more ferociously. China has said citizens of the highly autonomous city will elect its next chief executive - currently chosen by a select group of 1,200 electors - although many are said to fear Beijing will manipulate the process to ensure a loyalist wins. Swire's offer of help - rejected by current leader CY Leung - also gains little support from the paper he used to deliver his message. Columnist Alex Lo describes it as inconsequential, asking "who cares" what the Brits think? Pondering how American rebels or Indian nationalists might have reacted to offers of help from "former colonial masters", he concludes they would have "told the Brits - politely or rudely - to stuff themselves". Hong Kong is governed under the "one country, two systems" principle, allowing a high degree of autonomy and the retention of its capitalist economy and social systems for 50 years from the date Britain handed it back to China in 1997. And Beijing's Global Times suggests the calls for democracy contrast markedly with the days of UK rule, when governors were appointed by the Queen, asking: "When were the views of Hong Kong people ever heard?" Britain's last governor of Hong Kong, Lord Patten, attempted to pave the way for universal suffrage in the early 1990s but his efforts were hampered by political wrangling and Chinese opposition, meaning only stripped-back reforms were passed. 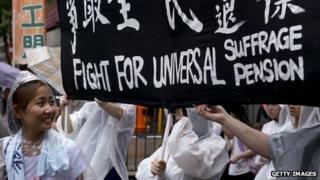 Democrats in Hong Kong have backed the UK's latest statements, with Democratic Party chairwoman Emily Lau Wai-hing telling local radio that - as a signatory to the Sino-British Joint Declaration - the UK "has a responsibility" to guarantee it's implemented, along with a right to express its views. Meanwhile, academic Chan Kin-man sums things up by telling the Ming Pao paper that the central government simply "overreacted".